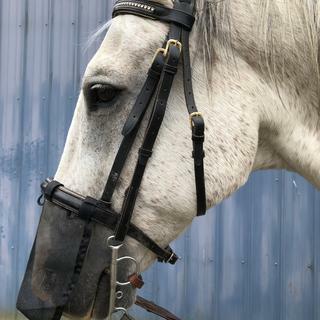 Quiet Ride Nose Net easily attaches to a nose band on any standard bridle or tie-down with a hook and loop closure. Covers the horse’s nostrils and helps protect from biting insects. Permitted by British dressage & British eventing associations. The Quiet ride nose net works great. My horse is very sensitive to bugs both real and imagined. This makes ourrides much more pleasant. Other people couldn't ride my Appendix Quarter gelding because he tossed his head so much . I read the reviews . My experience is a positive one as well as the many. It has made an unmanageable horse happy. I had a mare start tossing her head continuously on trail rides, I finally figuredout she hated bugs hitting her on the nose. We have lots a little grasshoppers that were really annoying her. This nose piece did the trick, absolutely no more had tossing. It was easy to attach and take off. Was looking for a solution with regards toviolent head shaking. Read reviews about covering the nose. Worked like a charm. We are all very happy indeed! My horse Tango is very sensitive to flies touching his nose. He throws his head violently when they contact his nose. When we are riding on the trail, this head tossing/bobbing can be annoying and distracting, not to mention I do not like to see him uncomfortable. We ordered the Quiet Ride Nose Net and, voila, the problem was solved. He will toss his head once in a great while if a larger insect like grasshopper flie at his face, but the problem we have had for years is basically cured with this inexpensive net. He is a 15.3H QH but think the regular size runs a little large and hangs past his nostrils, so I may try the smaller size. He can eat treats and graze with this but it would be better for us if it was maybe 1/2" shorter. Definitely pleased and would recommend. I have a full-face fly mask, but it was not keeping bugs of my horses' nose. This has seemed to help; although she still shakes her head. I think that it has just become a habit with her as she "thinks" there are going to be bugs flying around her nose. The problem is starting to lessen so I am hopeful that this will continue to help the problem. Overall, I would recommend the item. I bought this so the flies wouldn't bother my horse while riding. But at first she would toss her head, try to rub it off. She has since stopped doing that but i think it tickles her nose and causes her to sneeze alot. So i now only use it when i go on trail rides. I used this for the first time today along with the rump net. Both worked wonderful. My horse was very happy. Highly recommend this product. My horse constantly threw her head while riding. We explored all possible reasons to no avail. It was thought to be possible allergies. This net has all but elliminated the problem. I am hoping that this will be a good item to use to keep the blow flies out of our horses nose on our upcoming out of state trip. Want to try something that covers the nose when I ride.